Thats right, We now have a new Text Editor specifically for editing the files in your Packages/theme & Application/theme directories. Want to make a quick style change on the fly? No problem! We've even taken the liberty of initiating a cache flush after you save changes to speed up results. The Apex Editor can be found under the dashboard page (dashboard->Apex Editor). 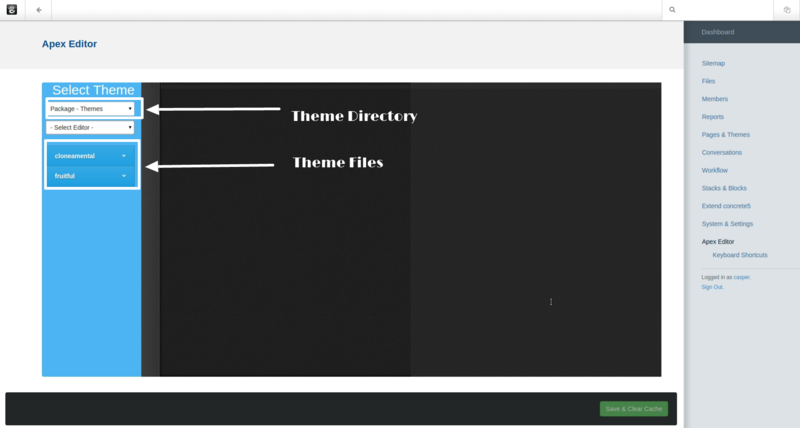 Here you can choose any theme from the selected Directory to edit (Package Themes and User Themes). For a full list of features included you can visit the Features page ( dashboard -> apex_editor -> features ). Need a theme to get you started? DISCLAIMER You are using the Apex Editor at your own risk. This Add-on was created to edit many different file types but users should be aware when editing .php files that mistakes made in PHP may break your site. Thus it is recommended that you should only edit .php files if you have access to the files on the server. While Developing/Designing it is best practice to disable your Theme & CSS, JS Cache, and Block Cache as described here.